Kritters Thoughts: I adore this series. This is a part of the Butternut Lake series and yes it is a series, but this is one of those series that you can read out of order, you can start wherever you like and enjoy. This is the 5th in the series and it centers around Billy Harper (a female, I know I had a hard time the whole book with a female named Billy!) and she is the local librarian and a single mom and has been splitting her time between these two important parts of her life. She hasn't pursued love because being a good mom has been her number one priority for thirteen years. In walks Cal Cooper who is moving back closer to his sister and her family and is having reprioritize his life as things have changed. I would describe these books as a combination of women's fiction with a side of romance. There is a fantastic plot for all the fans of women's fiction, but there are definitely some spicy scenes for those who like a little romance. I absolutely adore this series and would keep reading one each summer, but I wouldn't mind if Mary McNear wrote something new also. I would love to see what she could do in a new series, new town and new place. 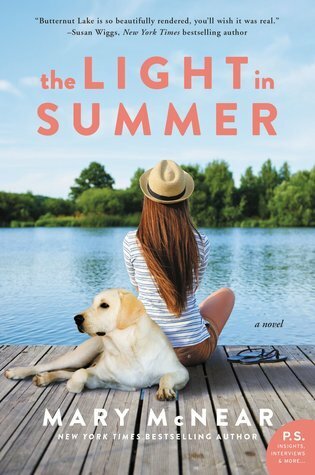 I've been meaning to pick up the books in this series ... Butternut Lake is one of those places I'd love to spend some time in!